This is one of the most amazing and easy to wear blush shades, I have left my full in-depth review above so that you can see my thoughts. I have worn this blusher almost every single day in the month of March. This month I have really been enjoying cream highlighters however I have used this product for making my base look more dewy by using it as a primer. This product really helps to illuminate the skin because it is very light and pearlescent. I was sent this fake tan around 5/6 months ago and I used it before a night out however I reused this again and fell in love with it. The shade looks very natural and also has firming agents to help improve the skins elasticity and tone the body. Hourglass are most commonly known for their ambient lighting powders and I can understand why. This powder can be either used as a setting powder or a highlighter. I like to use this product as an all over setting powder and this looks amazing on the skin because the powder itself is so finely milled. GWA kindly sent me over a lovely PR package filled with eyelashes and brushes and I have been loving both however I have thoroughly enjoyed using the powder and contour brush. The powder brush is amazing for applying the Hourglass powder and the contour brush works well with my Kevyn Aucoin sculpting powder. The brushes themselves are beautifully made however I do not want to give too much away as I am intending on posting a full and in-depth review on their brushes. Each brush handle is quite long in comparison to most of my normal brushes and the handle is a very dark brown wood. The brush hairs itself are ombre fading into a purple colour. I love these brushes and I cannot wait to grow my collection of them. 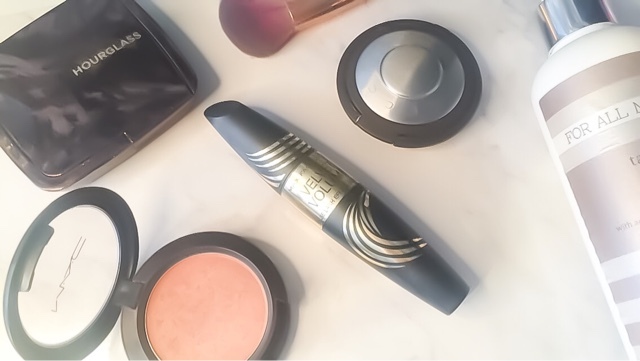 The final product I have been loving is the newest Max Factor mascara. It helps add length and definition to the eyelashes without looking clumpy.